Louth, the smallest of the Irish counties, lying between the Boyne Estuary and Carlingford Lough, bulks largely in Irish history, for it was always a border country and debatable land. It guarded the Gap of the North, the pass that runs from the plains of Leinster into the hills of Ulster. Here Cuchulain, the champion of Ulster, when Ulster had a pagan chivalry, had his first – century stronghold. At the Boyne River, the decisive battle between James II and William III took place in 1690. Brigid, “Mother of all saints of Ireland” – “Mary of the Gael” – was born in county Louth in the 5th century. 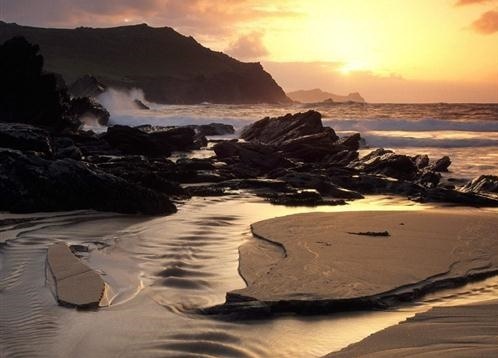 It is a highly-cultivated, fertile county of undulating pastures but it has also its long sandy beaches and quiet fishing villages like Clogher. Clogher - with Clogherhead (183ft) behind it – is a pleasant strange of whitewashed cottages going down to the sea. On the north side, about a mile away over the hill, is the harbour; and the dune-backed strand stretches for a mile and a half. Visitors from Drogheda, 9 miles distant, come here for fishing and bathing in the summer months. In winter this Irish Sea can be remarkably rough and unaccommodating, reminding one of Oliver Cromwell who’s indiscriminate massacre of the population of Drogheda has made his memory a by-word in Ireland. Tradition ascribes the roughness of the Irish Sea to Cromwell’s coffin, doomed to toss restlessly to and fro between England and Ireland, eschewed by both countries. Clogher and Clogherhead is a hidden gem, worth a visit on any Ireland tour.